First, I bought the car used about 3 months ago and it didn't come with maintenance records. It has 212K miles. After a few weeks, it started losing a little coolant. There was a small leak on the plastic part of the radiator that someone had tried to patch with epoxy and the patch wasn't holding. This past Saturday, that trickle became a massive leak. I bought a new radiator and upper/lower hoses and installed them Monday. Leak at the radiator is fixed. I've done this before, so I knew to expect some trapped air in the cooling system to take a little time to get out to the recovery tank. I've added a little coolant 2-3 times because of this. there is a sort of gurgling/hissing sound coming from the coolant recovery tank but I can't tell for sure if there is a leak there. Before the repair, (and after replacing the ECTS), the temperature gauge was consistently at 1/4 any time that the engine was warmed up. Now, the gauge goes up to 1/2 and sometimes a little over 1/2. I forgot (silly me!) to replace the thermostat while I had the hoses off. Maybe I should have done that - and maybe I will need to? I'll have to drain and replace most of the coolant to replace the thermostat, so I need to know whether this is a necessary repair. Mostly, I want to be sure that the car isn't running too hot. Rate the quality of this post and help Kaspar7 reputation points. Click the reputation button near the bottom left corner of this message box. Thank you! First and foremost pressure test the cooling system. If you don't you're just pi$$ing into the wind. Once you affirm the system can hold pressure buy a new pressure cap for the coolant tank. Cheap insurance. Properly bleed the cooling system to be sure all air is out. Get it all done at once- that way you aren't constantly draining and refilling the Coolant system multiple times. Replacing the cap seems like a smart idea. Don't have tool/know-how to test the pressure. when the car gets really hot (>7/8) some coolant gets past the recovery tank cap. I replaced the ECTS 2 days after I got the car ~3 months ago. the one I bought was defective - ugh - so I bought another one. Temp gauge normalized at ~1/4 and the DTC for the ECTS cleared. When hot, the upper & lower hoses get hot. Plenty of heat from the heater core; tested that with temp lever all the way up and fan on high. We're talking blast furnace here, with good air flow. As soon as I figure out where the water pump is, exactly, I'll have a look for any leakage. ECTS is fine, replaced 23 months ago. the DTC for it cleared as soon as I had a good ECTC in there (the first one I put in was defective, so I went back to get another one. Since then, the temp gauge has consistently read ~1/4 until just now. Hoses get hot, cabin heat is performing well. Fan is not turning with gauge ~7/8!! Checking the fan now to see if it will spin with 12V applied directly to it. This appears to be a major break through in time travel! I'm just glad they bring Saturn back in the future. Kaspar7, with questions of coolant temps and why the temperature needle swings more than it has after replacing the coolant sensors, there may be a simpler way to have an overall perspective - using a reader capable of displaying coolant temps. If you don't own one and are confused as many about which one to buy, you might consider a free app (option to upgrade for a few dollars) for cellphone use and a bluetooth adapter plugged into the OBD II port. A popular app is Torque and a generic bluetooth adapter from ebay. Members already using them can recommend bluetooth models. Or buy a plug-in reader. Observing actual temperatures may give you more insight to correlate temps to every day driving. And these OBD II tools can decode the check engine light. What I need right now is the #$%^&^ bolt that holds the fan shroud to the radiator. I was taking the fan out to replace the motor. That went fine, but... Friggin' time warps! I took the bolt out and put it in a magnetic parts tray with the other bolts and nuts I removed. So naturally, it has vanished because it's 5:00 and I don't have much good light left. I need to know what thread size and length that bolt is. Probably find one at Home Depot - if I know what to get. It's about 5/8" long, has a 10mm head. Don't know any more than that. Me, too. But why is there no dealership? I need parts. it's running really hot now; went clear up to the red zone and the Hi-Temp light came on. Fan isn't coming on. Bought a new fan motor and replaced that. But now I can't find that ONE bolt that holds the fan shroud to the radiator. I put it in a magnetic parts tray when I took it out, to prevent losing it!! That bolt was missing when I got the car. Found a replacement in my collection of old nuts 'n' bolts. But didn't think to get a spare before I put it in the car. Now it's gone. Moved the car far enough (downhill in neutral, not cranked) to look all under it. No luck. I'm old school too but kept up with changes to EFI systems. My L300 and $150 service manuals (bought back in '05) allows me to stay abreast of changes while educating my me on the nuances. There's no stopping off progress with cars. If you know the bolt size is 10mm, can you remove any similar bolt to see if it fits the threaded mounting hole? Some careful experimenting can help determine which metric nut or bolt is needed before going to Home Depot for replacements. All I knew was that the head of the bolt fit a 10mm socket. Didn't know the bolt diameter, thread size or length. BUT, I located one of the blind-nut clips that was left over from the radiator job (the radiator came with 4 and I only needed 3). Took that nut to Home Depot and found a bolt that fit it. Turned out to be a 6mmx1.0, 20mm long. didn't have the fancy head with the built-in washer, so I slipped a properly sized stainless steel washer down the bolt shaft and threaded it in. It fits like a glove. tomorrow I get to determine whether the fan will turn on when it should - and get a temperature reading just in case. Good thing I fixed the heater core and the misfire in the Jetta on Saturday, so I have something to drive to the parts stores! Properly bleed the cooling system to be sure all air is out. How do I bleed the cooling system to be sure all air is out? For me it was fill, drive, cool down, repeat. Took 3 or 4 times and now it's good. While you are in there anyway, check the line that dumps into the back of the reservoir for a solid flow stream. It can be done with the line on the reservoir, but I've found that taking it off it probably just as easy and you can see the flow better. Just disconnect, dump it in the (open) reservoir, and then check flow after starting the car. Best done with the car cool. The single cammers don't generate a lot of heat, so if it's heating up quickly the line could be suspect. The Water Pump is located on the Passenger Side of the Engine- about midway. If you take off the Passenger Wheel, and the Splash Guard immediately behind the Wheel, you will see the Main Camshaft Pulley. 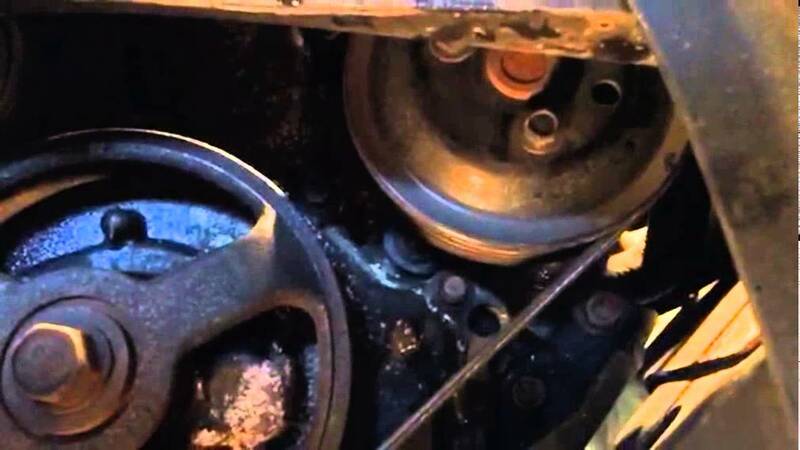 Look just up and North East of the Camshaft Pulley and you will see the Water Pump Pulley.